A Filter Cube II in the Bleyle Quarter in Ludwigsburg. Filtration specialist Mann+Hummel and Stuttgart construction company Wolff & Müller have joined forces for a pilot project to reduce fine dust pollution and improve air quality. 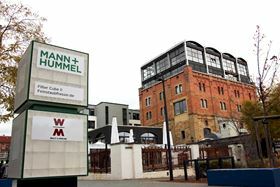 At the Bleyle complex in Ludwigsburg in Germany, the two companies are testing three new stationary fine dust filters developed by Mann+Hummel called Filter Cubes II. Mann+Hummel has been testing stationary fine dust solutions since the middle of 2017, including a prototype in front of the company's own headquarters in Ludwigsburg. Wolff & Müller is now the first external project partner to test the newly-developed Filter Cubes II. The Bleyle complex, which is home to several companies belonging to the Wolff & Müller group was the area selected for the joint project in Ludwigsburg. The adjacent and busy Martin-Luther-Straße thoroughfare and the nearby railway offer the ideal area for the tests. The Filter Cubes II from Mann+Hummel are about 2.5 m high and consist of two connected modular components. Equipped with fine dust particle filters and high-performance blowers, they can actively remove fine dust from the ambient air and have very low energy consumption. A control unit can be used to adjust the operation of the fine dust filters to react to the current quality of the air. The CES Innovation Awards celebrate outstanding product design and engineering. The brake dust particulate filter from Mann+Hummel claims to reduce the emission of particulates.